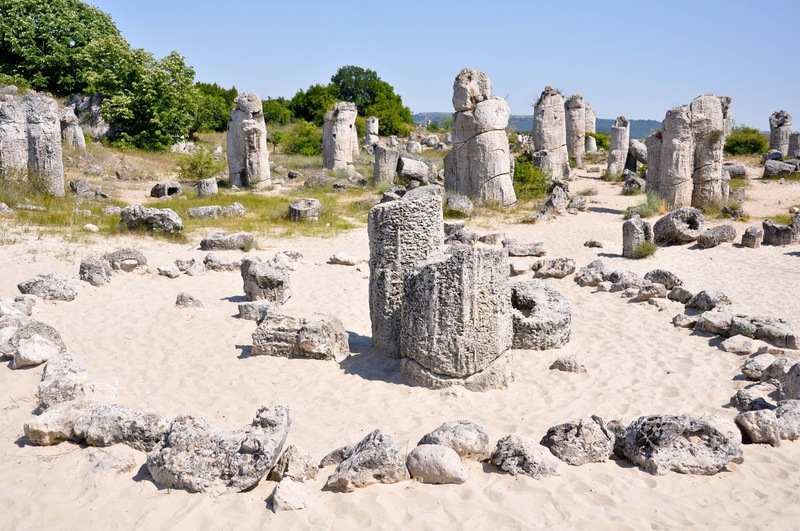 The thing which always amazes me when I visit the Stone Forest just outside Varna is how much it seems left to its own devices. For a place which is unique in so many different ways, you would think the Bulgarian authorities would grab the opportunity to present it to the world as best as they could. For when you enter the Stone Forest it is like you have stepped through a door into another dimension. 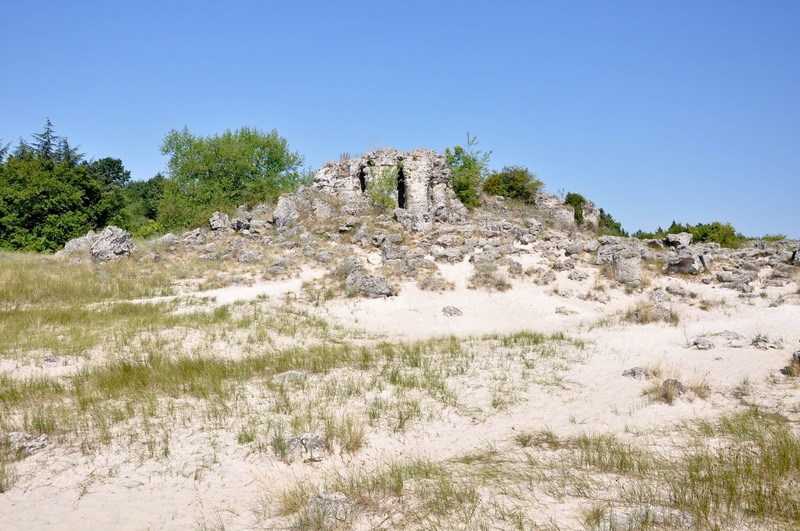 Surrounded by lush countryside dotted with orchards and fields with thousands of sunflowers in bloom, here is one of the very few desert habitats in Europe. Fine gold sand crunches under your feet. Sparse grass and perennial succulents seem to be the only things which thrive here. Undulating dunes mark the rhythm of the place. Above them all tower the pillars. Mighty stone pillars up to 7 m high with rough porous surface and hollow insides stand up, lie down or crumble in dozens of pieces. No-one knows for sure how they came to be. Several theories and legends speculate over their formation. 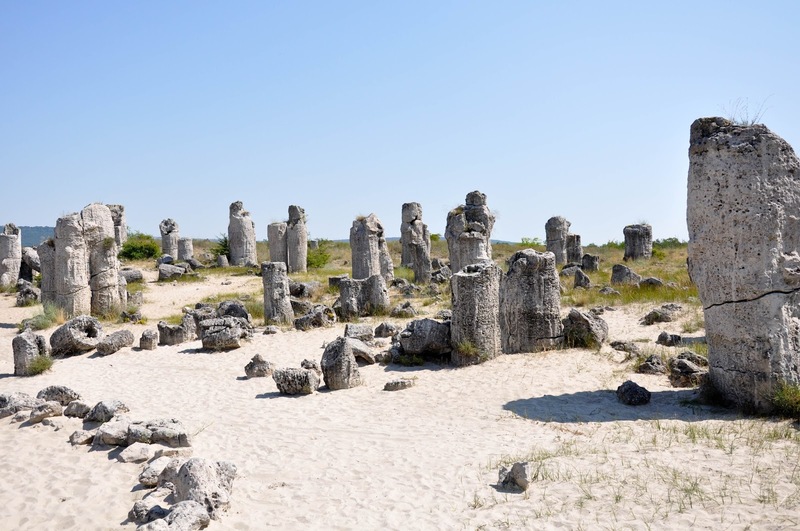 Scientifically it is thought that the area was the bottom of a sea which receded hundreds of thousands years ago and the pillars were formed by organic or mineral processes. 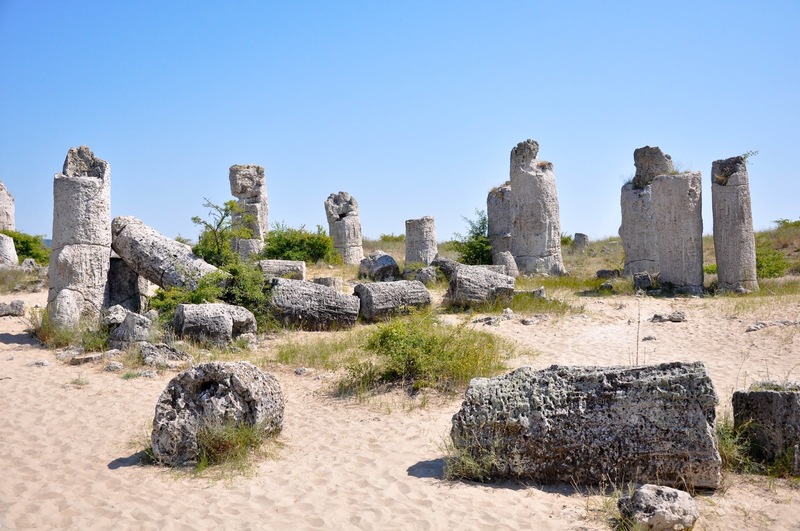 A local legend states that the pillars are the petrified bodies of the giants who requested that a young immortal man reveal to them the name of God so that he could marry a beautiful girl originally destined to become the giants’ leader’s wife. 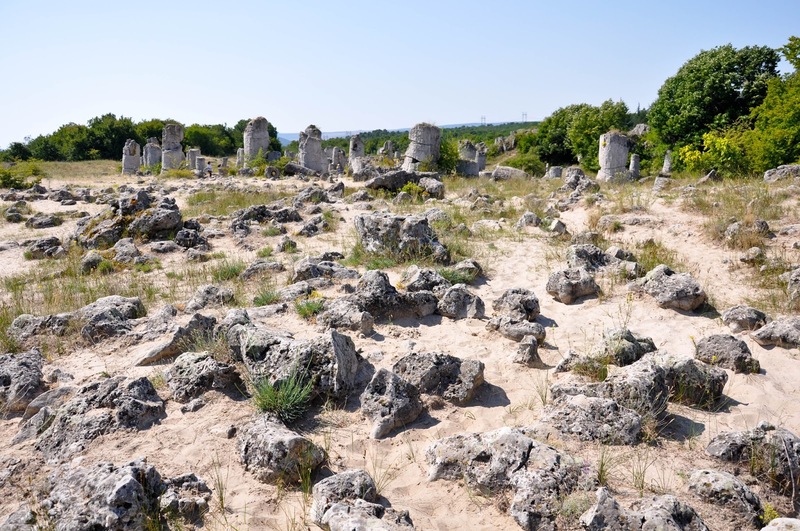 Nowadays the Stone Forest is spread over 13 sq km. 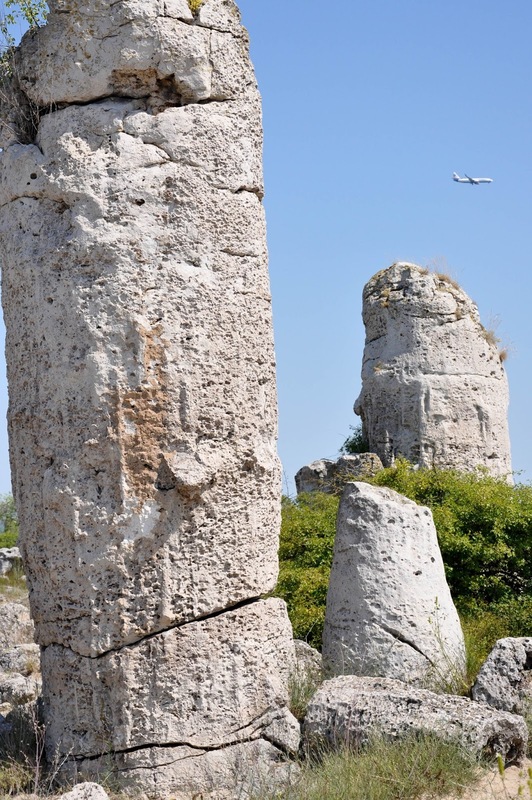 Tourists visit the central agglomeration of pillars – an 800 m long area with the biggest concentration of stone formations. The place has a lovely energy to it. You step onto the sand, barefoot if you can, and time ceases to exist. It all feels unhurried, relaxed, somehow unreal. The world lapses somewhere far away. 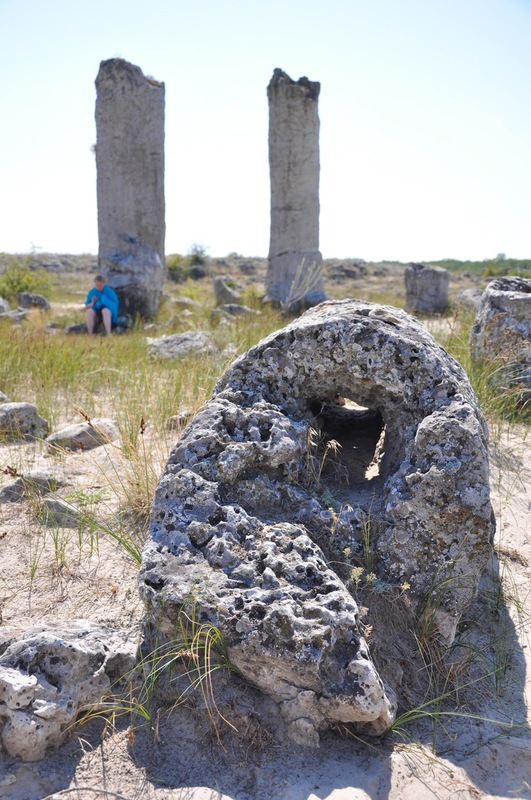 It is easy to spend an hour or two simply walking round the pillars, sitting down for a while to absorb the view and then slowly exploring the area further down the dunes. 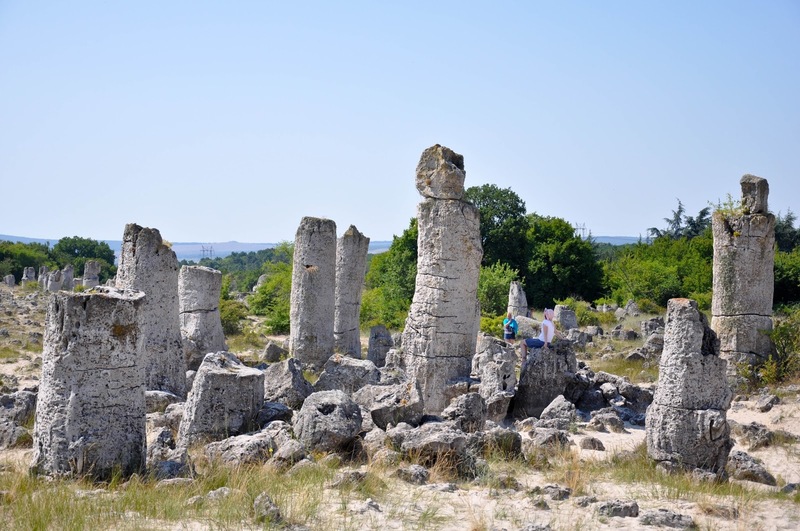 Our first visit to the Stone Forest was in April 2014. We followed the road leading us out of Varna and past the agricultural lands with villages at the bottom of the hills on the horizon. Planes zoomed above us headed for the nearby airport. It took us less than 30 minutes to reach the place from the city centre. The road was good, lacking the prevalent potholes Bulgarian roads often suffer from. It had another ugly issue though, for along the way girls and women brimmed the road dressed in tiny skirts and high heels. They seemed to hitch-hike, but were in fact waiting for punters happy to remunerate them for services of certain kind. It made for an uncomfortable journey. 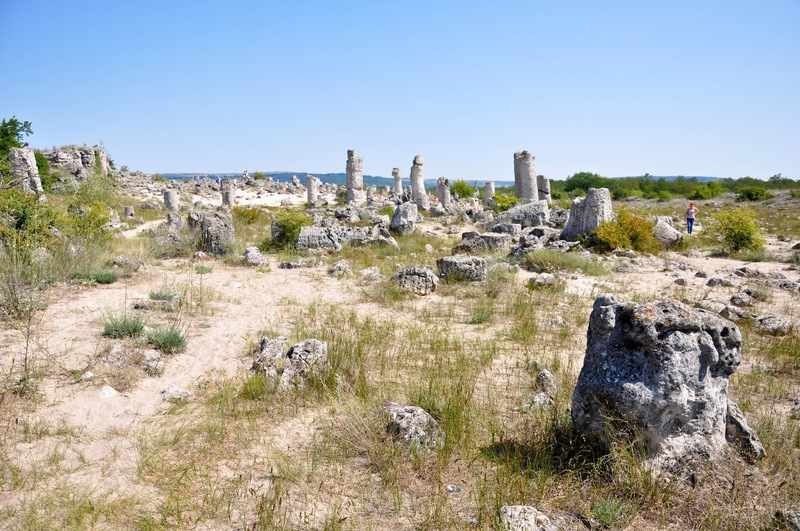 Once we arrived at the Stone Forest, we found the place deserted. A small shack at its entrance sold tickets at 3 levs each and contained a small collection of posters describing in several languages the history of the place and the different theories and legends about its formation. A young chap talked us through them all and then left us to explore the forest. My husband and I were the only visitors at that time and we wandered, hand in hand, down the dunes and between the pillars. Some of them have been given names by the researchers of the place and we tried to spot the Camel, the Soldier and the Lonely Man. 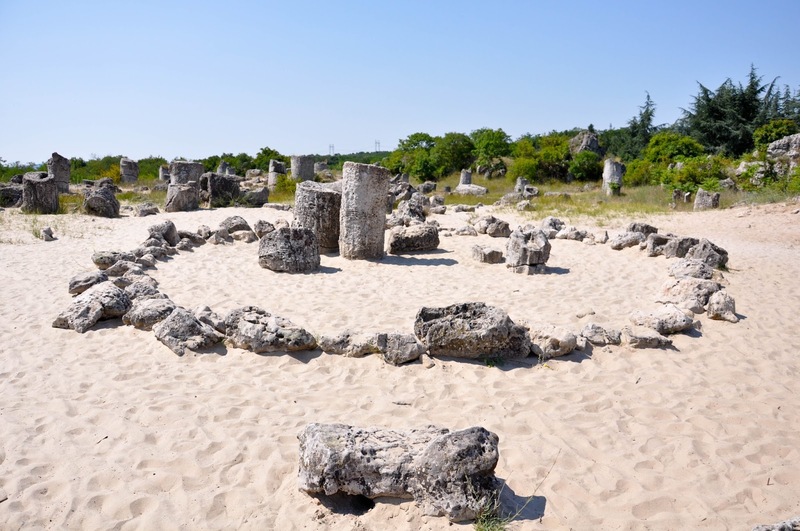 At the end of our walk we reached the Magic Circle – the point where the energy attributed to the Stone Forest is believed to be at its strongest. Following the established tradition, we walked into the circle marked with stones (the only thing formed by human hand in the whole forest) and we made a wish. 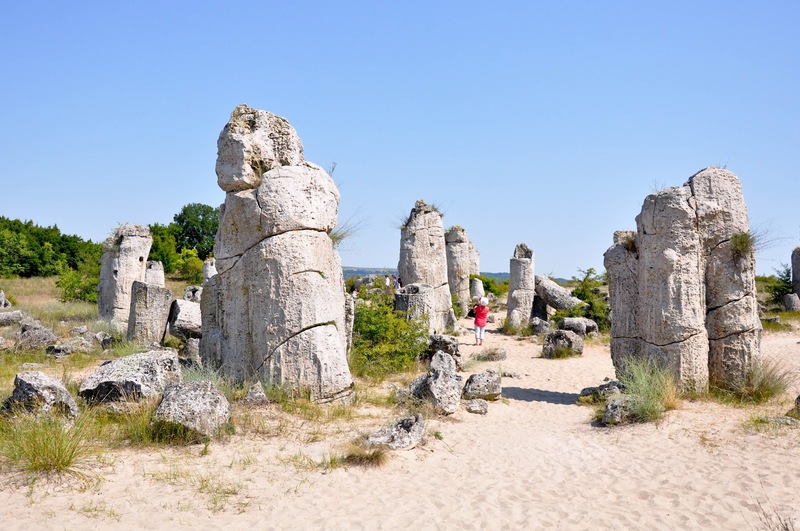 I loved the time we spent there so much, that I was really looking forward to returning to the Stone Forest during our visit to Bulgaria in the first half of July this year. So, on a hot and sunny day, my husband and I piled in the car and off we went. On the drive there through the sunflowers in bloom I was telling my husband how the Stone Forest reminded me of the experience we had had on the shores of Loch Ness in Scotland. 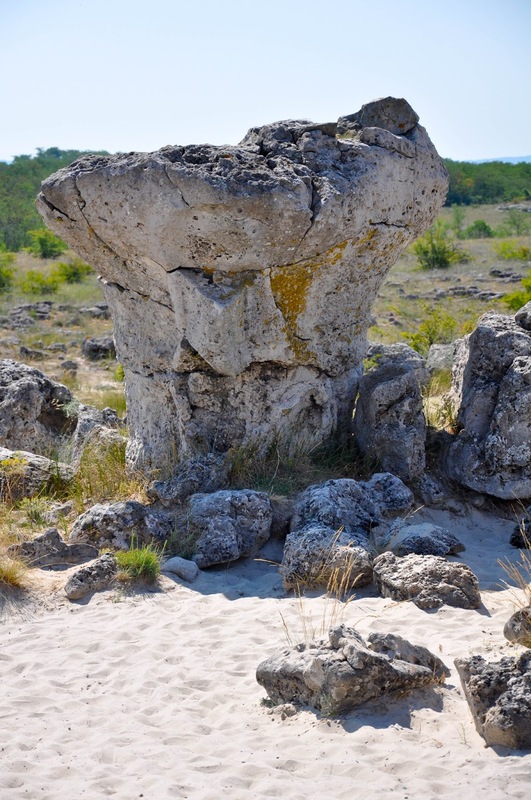 Although one is a stone pillar desert and the other is an allegedly monster-inhabited lake, both places have an amazing energy simply sprouting from them. Loch Ness’s is dark and mystical whereas the Stone Forest’s is uplifting and magical. Both places offer stunning natural set-ups favouring the creation and propagation of captivating local legends. Both places are also intriguing from a scientific point of view and have attracted many researchers. Yet, what differentiates them in my eyes is the approach that the local authorities have taken to them. In the village of Drumnadrochit on Loch Ness shores there are two exhibition centres exploring in detail the legend of the water horse and the research conducted in an attempt to establish if the lake could really harbour a mythical monster such as Nessie. In addition, a large exhibition centre has been built facing the ruins of Urquhart Castle which sits beside Loch Ness. The visitors receive as much information as they can absorb – through films, expositions and flyers. Large souvenir shops sell anything and everything related to Nessie. Boats take you round for a spin whilst the skippers tell you about Scotland, its legends and the mystical lake. Through it all visiting Loch Ness becomes once in a lifetime experience to cherish and talk about for years to come. Things were far from hi-tec at the Stone Forest. We found our way to it following our trusted GPS. Upon arrival, we left the car in the vast parking lot which was covered with rubble and not tarmacked. A couple of coaches were parked there too, offloading tourists from the nearby resorts. Dust clouds covered our feet as we walked to the entrance of the Stone Forest. A small path lined up with wooden railings led to the shack we had first seen during our previous visit in April last year. Just as we stepped on the path and without touching it at all, the first wooden railing fell right next to us almost hitting us in the process. Well, I screamed and jumped back. Inside the shack, I told the people selling the tickets about this unfortunate event and they couldn’t have been more apologetic, mentioning in passing that the railings decay in winter and there is no-one to change them come spring. The large posters with information about the Stone Forest still hung on the walls. They were pointed to us and it was politely suggested to read through them to learn more about the place. The posters were covered with lots of texts. Long paragraphs in small font ran from top to bottom. I craned my neck and still found it difficult to see the text at the top. Just then the little shack got busy with a group of tourists and eager to avoid the overcrowded conditions inside, we escaped. Then the best part began – walking through the forest. As the place is so big and imposing, even with a couple of coachloads of tourists traipsing through it, it felt really tranquil and like we had it all to ourselves. 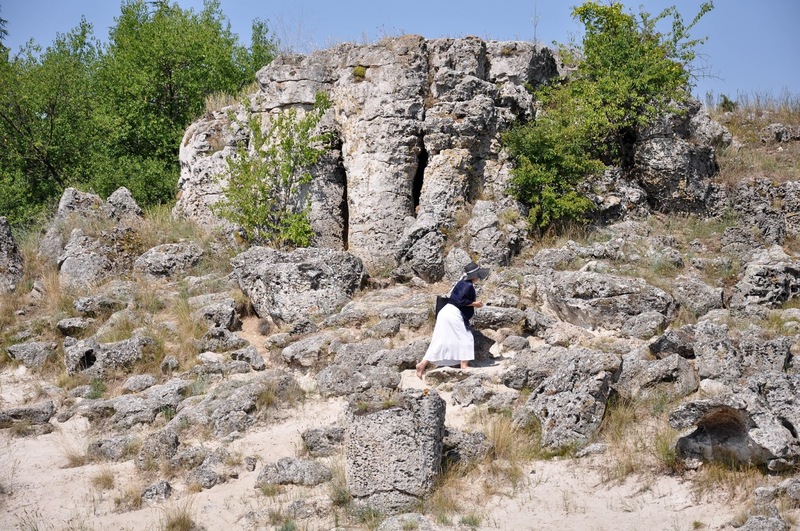 Once again we walked through the dunes, trying to identify the different stone pillars based on the names given to them. We spent some time looking round the stone cave. Then proceeded further to the quite aptly named Fertility Stone. Some of the tourists would sit on the pillars or step on the lower ones while walking round the place. A cameraman was filming one of the groups with all ladies dressed in their finery and with fancy hats guarding them from the sun. It was hot and bright, with the powerful sunlight dazzling the eyes. This only emphasised the outworldliness of the place. 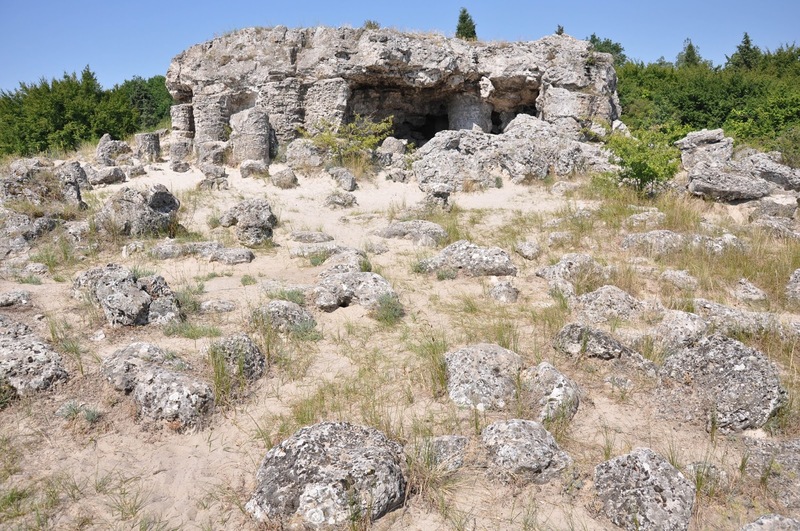 A few days later and over a cup of coffee in Varna, I was telling an old friend about my last visit to the Stone Forest and mentioned in passing that it would be great if the place gets a modern exhibition centre to itself so that it is better presented to the world.